The Book Bomb came. The Book Bomb went. And a very lucky local girl found my book! Her mom sent me an email to thank me, but I feel like I should be thanking her. For an author, getting your book into the hands of a young reader is even better than ice cream for dinner. This was a great big experiment, since I've never done a book drop before, let alone organize one. But I'm already looking forward to next year, when I'll have more books to drop and more writer friends to join in. In case you don't know what I'm talking about, a book drop is when authors leave copies of their book in public places for readers to find and take home for FREE. Sounds fun, right? My nephews slept over at my house Friday night just so that we could get up in the morning and drop my book. Nathan (Nate) is 9 and yes, I named my main character, Junior Guardian Angel, Nathan Christopher Coville, after him. Ty is 7 and can't wait until his reading skills improve and he's reading full middle grade novels like his big brother. We made a huge panful of chicken drumsticks and watched movies and practised parkour in my living room. Because that's what we do when we have a sleepover. Saturday morning, we drove out to Henderson Lake, which is a very pretty park in the middle of our city. 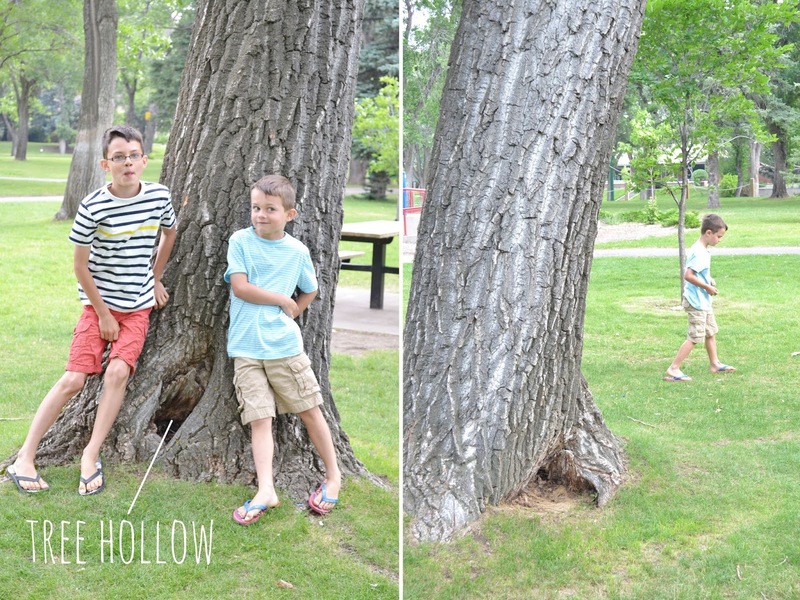 Nate and Ty helped me find the perfect spot to drop SPARK: in the hollow of a tree, away from the wind. Because it gets really windy on the Canadian prairies. We put rows of brightly colored rocks all around the tree and in trails leading away so that any kids who happened to walk along the path by the playground would see them and find my book. 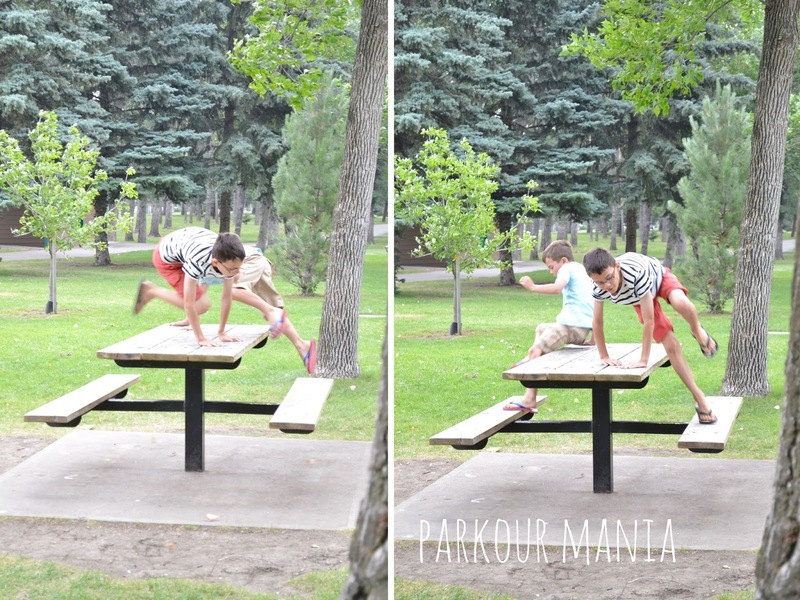 Nate and Ty also practised wrist spins on a nearby picnic table which is supposed to be helpful somehow...? When we were finished, we were tempted to hide behind some trees and spy to see who finds it. But that's kinda creepy - you really shouldn't spy on people. So we went home and just imagined some happy reader following the rocks and finding SPARK, all tucked up cozily in the tree hollow. In my imagination, there was a lot of cheering and fist pumping. I hope it was that way in real life. To the girl who found my book, I am sooooooo happy for you. "Just finished MG Spark by indie author Ginger Malacko. LOVED it and can now get back to MY mortal life. Until the sequel. Great read. 5 stars." "There's mystery, adventure, and an opportunity to examine our own motives and choices. Looking eagerly forward to the next volume. 5 stars." "The story has a strong yet appealing flow and carries the reader through the adventure like a tornado. 5 stars." "It only took me two sittings to read this book. Had I not had other things I had to do I could have read it one sitting. 5 stars." "I was drawn in by the mysteries, the slowly teased out details, the character's flaws and struggles to overcome them, and the fresh ideas. I want more...Even though this is a first book by an indie author, it was better written than the Hunger Games. Bravo Ginger. 5 stars." "A strong sequel that moves the story along and brings more action and drama for the young angels. Highly recommended. 5 stars"
"The author does a great job of not only keeping the pressure on so that you have to keep reading, but she also does an excellent job of making sure the characters are changing and growing. This was another page turner...I can't wait to recommend this to my sixth graders this year. 5 stars"
"I love this author's work! She doesn't just tell a great story, she teaches life lessons as well. Thanks for another great read! 5 stars." "Loved reading these two books with my 13 and 9 year old boys. Characters came to life and we couldn't wait to read this book every day. 5 stars." Designed by Ginger Lee Malacko. Powered by Blogger.